While gourmet food is often associated with long preparation, one of the most important factors is the inclusion of high quality ingredients to make great tasting food. With the time pressures that plague most of us these days, convenience foods that provide superior quality are some of the most valuable available. Naturally Nora fits the bill with a superior product that provides vital ease of preparation. Nora Schultz, President and Co-Founder of Naturally Nora, Inc., recently agreed to discuss her innovative product line. LoveToKnow (LTK): Tell us a little about your products and what makes them different from other mixes out there? 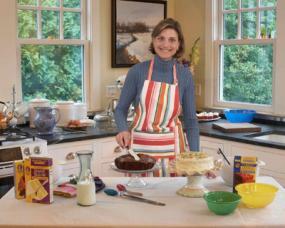 Nora Schultz (NS): Unlike other mixes, our products are 100% natural and contain no artificial ingredients. No hydrogenated oils (no trans fats), no artificial flavors, colors, or preservatives. They also do not contain any dairy or soy and can be prepared dairy-free or soy-free. You can see how different they are from other brands on this comparison chart. People tell us they have a very "homemade" flavor and they're happy to pass them off as their own. LTK: What inspired you to start Naturally Nora? NS: As a mom, I love spending time in the kitchen with my children. Not surprisingly, they love to prepare desserts! It's important to me that they develop healthy eating habits and know what's in the food they eat. Boxed cake mixes and canned frostings were a huge time-saver for us, but when I learned what was in them I was very unhappy. I didn't like telling my children I didn't want to make the cakes they wanted- particularly the confetti cakes (with little colored sprinkles in them). Since I couldn't find any mixes that I felt good about, I decided to develop my own. LTK: What have been the reactions to your products in the marketplace? What kind of feedback do you get from customers? NS: The positive response has been overwhelming. I never expected to get the unsolicited emails and phone calls of "thank you!" that we receive. LTK: For those with dairy sensitivity, is there a substitution for butter you recommend in the frosting? NS: Margarine (trans-fat free, of course) works very well as a substitute for butter in the frosting. Soy milk also does an excellent job in place of cow's milk. 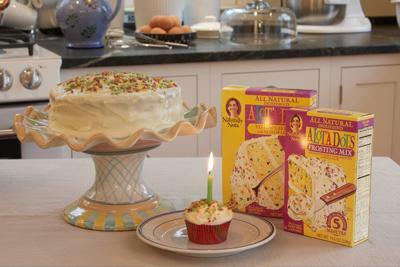 LTK: While most of your mixes do not have any corn syrup, the colored bits in the Alot'a Dots cakes do contain it. With some of the recent news on high fructose corn syrup, do you have any plans to replace that with sugar or another ingredient? NS: We've definitely had that conversation, and we do not use high-fructose corn syrup. The colored bits are made from a base of corn solids and "simple" corn syrup- which so far have been the best natural substitute we've found for the ingredients in artificial sprinkles. LTK: What is the most popular cake flavor? NS: Sunny Yellow is the most popular, but Cheerful Chocolate is a very close number two! LTK: Where can interested people find your cake and frosting mixes for sale? NS: They can find a local retailer on our website or find a retailer that sells them online at Naturally Nora. Amazon currently offers a variety pack with three Naturally Nora cake mixes and three frosting mixes. LTK: We understand you have an initiative called "Bake Great Schools" to help schools with fundraising. Here at LoveToKnow, we love to hear about companies that give back to their communities. Can you tell us about the program and why you started it? NS: As parents, we recognize that community fundraising efforts are critical to schools. Parent-raised financing often covers books, arts programs, even new facilities. We found ourselves donating mixes to our children's schools to help them generate additional funding and created our "Bake Great Schools" program to help schools across the country. Many organizations hold bake sales or other events during which they sell refreshments. We will donate cake and frosting mixes (quantities limited) to any tax-exempt PTO/school organization that wants to prepare and sell cake to raise funds for their school. LTK: Now that you've proven your success in the cake and frosting mix markets, is there anything new in development we can look forward to seeing from you? NS: Yes! Keep your eyes open later this year for our new brownie mixes. There will be many more all-natural and delicious products to come from Naturally Nora. Currently, this line of natural baking mixes offers options for chocolate cake, yellow cake, vanilla cake with chocolate cookie bits and vanilla cake with colored "confetti." The frosting comes in vanilla, chocolate, vanilla with colored sprinkles and vanilla with chocolate cookie stars. With a full array of cake mix and frosting flavors, and no artificial ingredients, Naturally Nora has unadulterated baking solutions that taste gourmet and provide fun the whole family will love!